Brand new updates to great Encinitas Ranch home. 4 bed, 3.5 bath, 2578 sq.ft. on cul-de-sac. Solid oak floors. Designer counter tops & back splash. New Kitchen Aid SS cook top, hood, oven, microwave, refrigerator & dishwasher. Kohler sink & Hansgrohe faucet. Solid oak cabinets-freshly painted-new LED lights-new hardware. Updated fireplace. New door handles. Powder room updated. Freshly painted interior, front door, garage door & porch. Fresh sod & flowers in the backyard. Great soaking spa w/new cover., Welcome to Devonshire of Encinitas Ranch in one Encinitas' most desirable neighborhoods. This central location is minutes to great beaches, schools, dining, shopping and more. It is located at the end of a cul de sac with great views of Encinitas Ranch golf course. The seller had the builder put in an additional full bathroom upstairs at the time of construction. Additional insulation was added for more efficient heating and use of the air conditioner. The curb appeal is welcoming with a custom tiled front porch with golf course views that leads to the living room. Upon entry there is oak flooring, custom paint and 10' ceiling. The kitchen has beautiful oak cabinets and a center island. There are brand new gas cook top, built in oven and microwave. The walk-in pantry is large. The kitchen opens up to the family room and backyard that makes entertaining a joy. The family room has a fireplace. The laundry room is good size. The staircase has oak flooring. The master retreat features vaulted ceiling, 2 large dual walk-in closets, a custom glass block shower enclosure, large bathtub, his and hers Corian vanities and private water closet. Throughout the home are plantation shutters and custom Hunter Douglas window treatments. There are 2 bedrooms upstairs that share a Jack and Jill bathroom. The third bedroom has a bathroom of its own.The backyard is spacious and includes a Hot Springs spa. 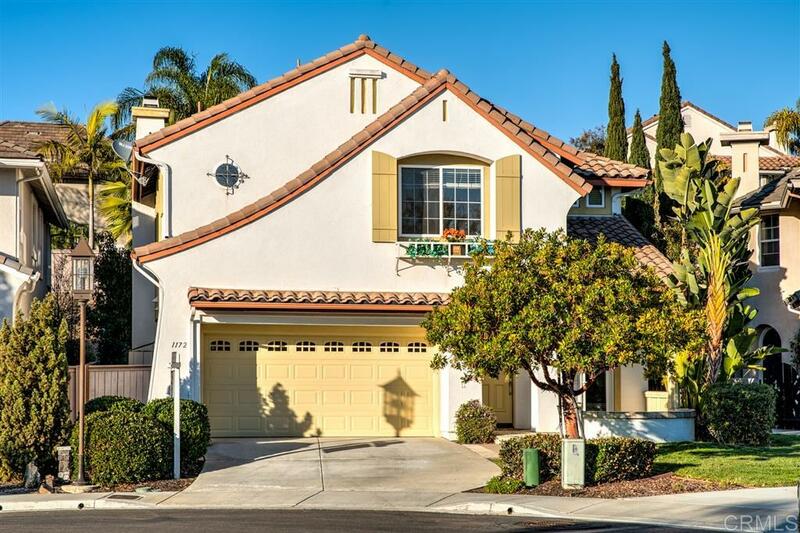 The design and cul de sac location of this home are well suited to families and this home has all the features of an executive home too with the added bonus of the Encinitas Ranch Golf Course only steps away.